I know I said it about the last comic, but this one came out perfectly as well. 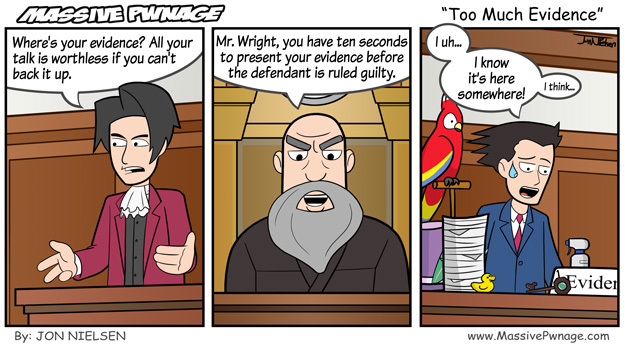 That Edgeworth is awesome. Where does Phoenix keep all that evidence? In the later trials, you have sooo much evidence, it’s hard to keep track of it all. So where does he keep it? I’m still working on the second Phoenix Wright. I’m on the last trial. I’d like to finish it, but Rock Band keeps distracting me. This entry was posted on Monday, June 23rd, 2008 at 12:00 am and is filed under Comics. You can follow any responses to this entry through the RSS 2.0 feed. Both comments and pings are currently closed.